Easter Reading Escape Room! Get your readers ENGAGED in reading! 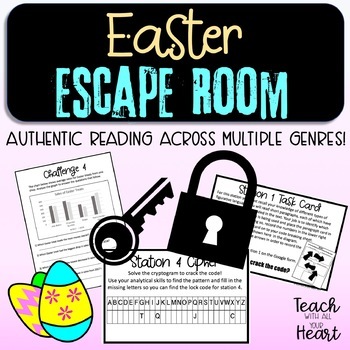 Students will practice and apply reading skills and strategize across multiple genres in this escape room. Escape rooms are the latest craze to take classrooms and it is easy to see why. Students are engaged like never before! They are participating in challenging games that they WANT to engage in, all the while using critical thinking skills! They will also put their context clue skills, inferencing skills, and problem solving skills to work! Don't forget to grab these escape room photo props to complete the experience!!! Click here to see Escape Room Photo Props! 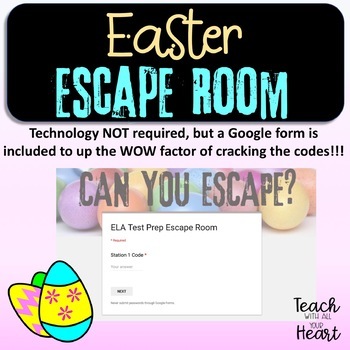 CLICK HERE for ELA Reading Test Prep Escape Room! This escape room was designed with minimal prep in mind for busy teachers. You will only need paper clips and envelopes (if desired) to help your materials organized. Just 2 of the escape room challenges require cutting, but those tasks were designed to be completed easily with a paper cutter. CLICK HERE to see my Book Buffet book tasting resource! CLICK HERE to see Fidget Slime Persuasive writing. Should slime be allowed in class? CLICK HERE to see Fidget Spinner Persuasive writing. Should fidget spinners be allowed in class? CLICK HERE to see Teach Appreciation kindness note cards! CLICK HERE to see reminder Sticky Note Bundle! Keep your parents informed in a cute, fun way! CLICK HERE to see Cactus friends Classroom Library sign out sheets! CLICK HERE to see my writing task card BUNDLE PLUS corresponding writing Choice Board menus!